George Zimmerman’s wife Shellie says their marriage is on the verge of ending and that she is going to have to “think about” whether she will stay with him, as it is revealed he “beat down” her self-esteem. Shellie Zimmerman, 26, stood by her husband throughout his lengthy murder trial and even admitted to lying to a judge about the couple’s finances – a decision that led to her arrest. On Wednesday, she pleaded guilty and was sentenced to probation and community service. She also revealed that the couple hid out in a 20-foot trailer in the woods and lived in fear every night that one of the thousands of people who had threatened George Zimmerman’s life would find them and kill them. Shellie Zimmerman refused to say whether she and George are still together – but that doesn’t change her opinion on whether he murdered Trayvon Martin. She said she always believed he killed the unarmed teen in self-defense. Investigative journalist Christi O’Connor spoke with Shellie Zimmerman in her first public interview since her husband’s acquittal on July 14. The interview aired this morning on Good Morning America. “I can’t tell you how many nights I’ve laid awake at night just thinking I wish to God these circumstances were different,” she said. 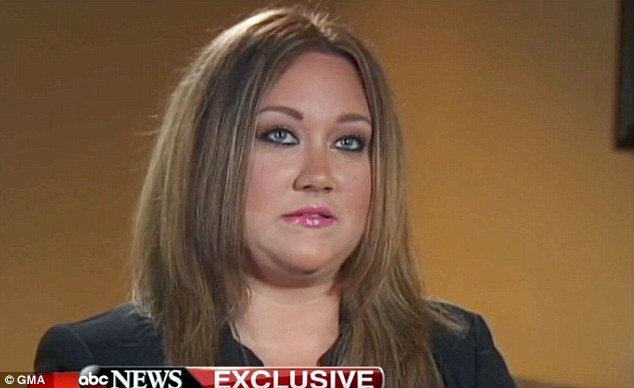 Christi O’Connor told ABC News that George Zimmerman has “beaten down” his wife’s self-image. “When I asked her why she was doing this, Shellie said, <<I want to start my life back>>,” Christi O’Connor said. When asked whether she was still together with her husband, she refused to answer. Shellie Zimmerman stood by her husband throughout lengthy criminal that sent them both into hiding when George became a symbol of racial tension. She appeared at every court hearing for him. And even now, she stands by his actions that night, when the neighborhood watch volunteer confronted a teenager he thought looked suspicious who was walking through his neighborhood. When asked if she thought George Zimmerman had targeted Trayvon Martin and murdered him in cold blood, she he’s “not capable” that kind of behavior. “That’s not his way,” she said. Despite her presence at his court hearings, he was not in court Wednesday when she admitted to perjury when she lied about how much money the couple had raised on a website established for George Zimmerman’s legal defense. “By lying under oath, I let my God down, I let your Honor and the court down, I let my family and friends down, and, most of all, I let myself down,” she wrote in an apology letter. Shellie Zimmerman received 100 hours of community service and a year of probation. She said she plans to do the community service at a Christian ministry. Tens of thousands protested when he not arrested Trayvon Martin’s death in February 2012. Hundreds of other people issued death threats against George and Shellie Zimmerman and their families. The couple were forced to flee their home in a gated community in Sanford, Florida, and go into hiding. “We have been pretty much Gypsies for they past year and half,” she said. She also revealed that the couple’s marital problem did not come as a result of her husband’s killing of Trayvon Martin, nor even from the hiding out. They began even before George Zimmerman became a household name. Shellie Zimmerman revealed that the night George shot Trayvon Martin, she was staying at after her father’s house because she and her husband had had a fight. She also expressed sadness for Trayvon Martin’s parents, who have been vocal in demanding George Zimmerman be sent to prison. “I’m so deeply sorry for the loss. I can’t even begin to understand the grief that a parent experiences when they lose a child,” Shellie Zimmerman said.